The Home of the Spondyville Fusers! 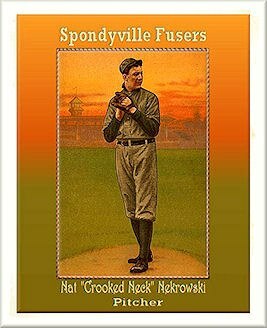 Now that the Boston Red Sox have "reversed the curse" (of the Bambino), the oldest baseball team curse now belongs to our beloved Spondyville Fusers. 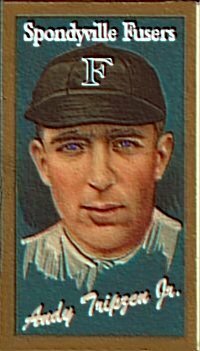 As the legend goes, in 1921, the ace of the Spondyville bullpen was a native American pitcher named Slim Phrozeneck, a.k.a. 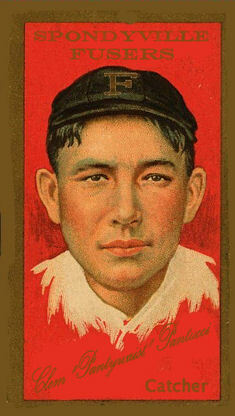 "The Lakota from Dakota". 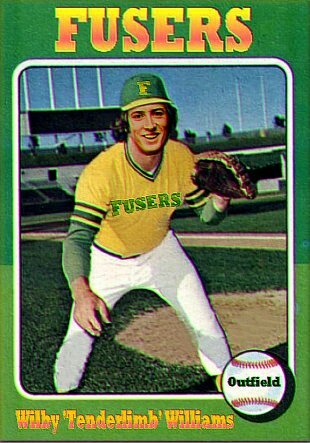 One day, as the season was drawing to a close, and the Fusers were battling the Rhode Island Rheumatoids for first place, Slim was strolling down Main Street, about to turn the corner and head over to the ballpark, when he "stepped on a crack and fused his catcher's back." 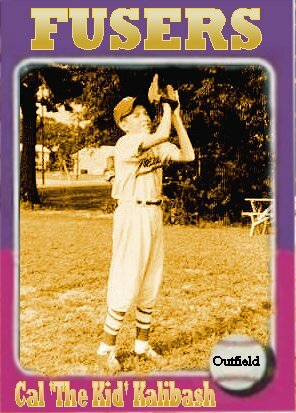 This untimely mis-step resulted in the Fusers power-hitting backstop, Amos "Stubby" Stiffens having to miss the last three weeks of the season, which cost Spondyville their chance at a pennant. 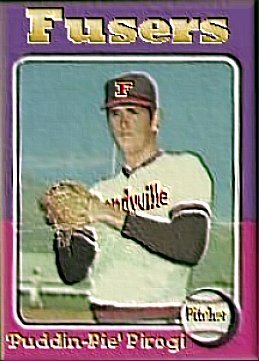 Since that time, Spondyville has not only not won a pennant, they have never finished higher, (or lower for that matter), than fifth place. It seems this "regular bunch of stiffs" (As Manager "Red" Blackendecker has named them), is doomed to be mired in mediocrity forever. The curse has come to be known as the "Sidewalk Hex of '21" or more alliteratively as simply, "Phrozeneck's Footfault". Over the years, many attempts at "Losin' the Fusin'" have been made, but all have proven to be ineffective to say the least. 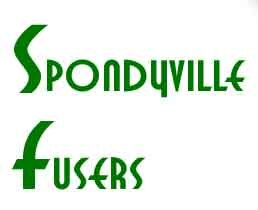 In Spondyville, however, Hope (but not much else) springs Eternal, and devoted fans of the Fusers can always be heard optimistically muttering under their breath, "Wait 'till next year, you, (expletive deleted)!!" And ... word from the Commissioner's office is that, right before the All-Star break, (or as the Fusers call it, "Three Days Off"), the newly sanctioned inter-league play will allow the Fusers to meet with the only two teams that they seem to beat with any real consistency; the Oswego Osteos (The Hobbling Osteos) and the Crohn's Corners All-Girl Cronies. Once again the odds on favorites this year to win their respective divisions, (Wait till next year, you %^#$#! ), are the Parkinson's Tremors and the Diabetic Blue Sox. 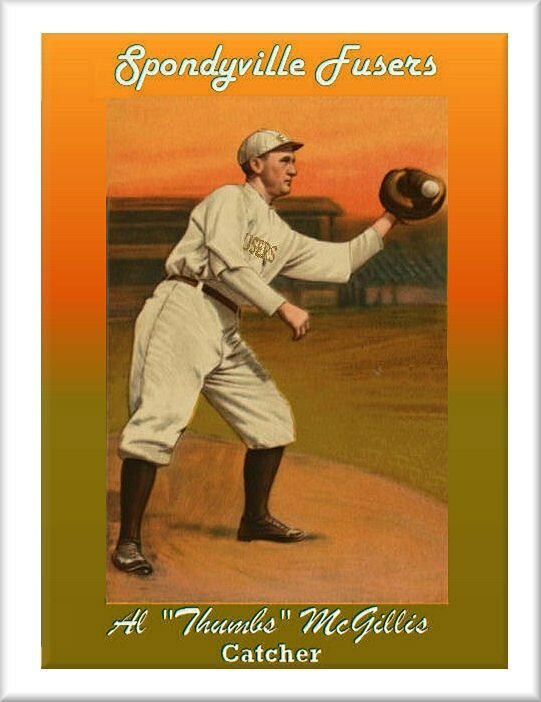 As always, the Gehrig City Lou Gehrigs have been disqualified for cloning. So goodbye Winter and come on Spring! We can hardly wait to watch our favorite team play our National Pastime ... and if they get around to Baseball, all the better!! Little known fact: The first woman to play for the Fusers was the famous Spondyville socialite, Marie Strumpell. She suited up for the Fusers in 1943 when, due to WWII, there were a number of vacancies in the team's line-up. Ms. Strumpell even pitched both games of a double-header on a hot Sunday in July, winning the first game 4-0, but losing the second game, in spite of a dazzling eleven inning, two hit performance, by the score of 1-0. Due to her arthritic fingers, she was known for her "Swollen Knuckleball." 2006 - Season of a Lifetime! 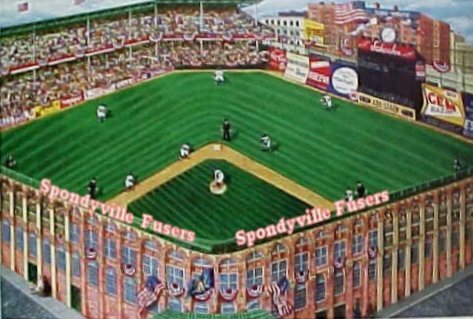 The year the Spondyville Fusers baseball team climbed out of their perennial basement placing and ascended to the lofty heights of ground level! For the first time in their long team history, our very own Spondyville Fusers made it to the Playoffs!! With the ill-fated collapse of the high priced replacements on the Rheumadelphia Rheumatoids, and the two dozen convictions for illegal use of prescription drugs on the Crohn's Corners Cronies, the fight for the final Wild Card playoff slot came down to the final game of the season between the hated Oswego Osteos, and our own beloved Fusers. The hobbling Osteos put up a spirited fight, especially in the early innings, as they got off to a well-deserved 16-0 lead. Five Fusers pitchers kept the game ... as close as could be expected, considering they were behind 16-0. 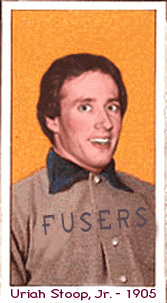 During the seventh inning stretch, the clever Fusers mascot, Spiffy the Snowspondy, managed to hide the visiting team's entire supply of Tylenol. 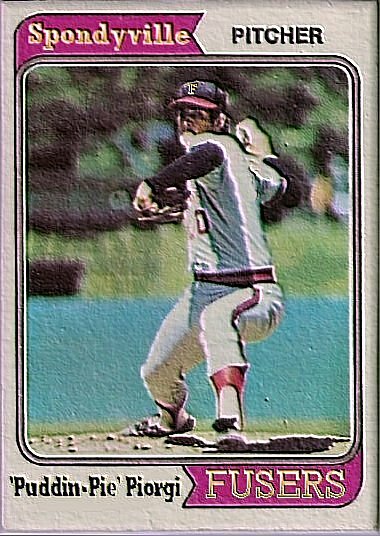 Still, things looked bleak until the bottom of the eighth inning, when Fusers outfielder Lem Onjello bounced a ball into the seats for a ground rule double. Feeling the pressure, (and the lack of Tylenol), the Osteos pitcher than walked the next 14 batters, making the score 16-12. After striking out the next two batters, Fusers First basemen, "Stuck" Piganelli, swung through a third strike, but the ball got past the Osteos catcher, who's knees were then so swollen he could no longer squat. The ball rolled all the way to the backstop and "Stuck" ran to first base, as the other Fusers rounded the bases and scored. "Stuck", who's running has often been compared to frozen molasses, rounded first, only to be tagged out. This ended the inning with the score "virtually" tied at 16-14. 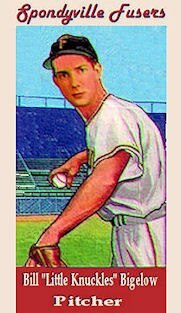 In a brilliant move, Fusers manager Buck McCall, then shifted his outfielders, moving them in to play deep infield, and the now pathetically hobbling Osteos, were held completely hitless in the top of the ninth. 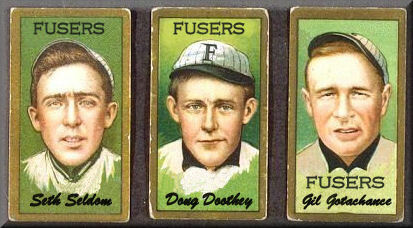 The Fusers came up for their final at-bat with the game on the line, and glory within their grasp. If it's Fall, it means one thing: Soccer. Now that baseball season has come to an end, the groundskeepers at Brogna Field will get the stadium ready for the opening game of the ASL's season. Spondyville's representative in the Arthritic Soccer League, is the team formerly known as the S.S.S., (Spondyville Soccer Society), in order to avoid frequent confusion with the S.S.S., (Spondyville Seltzer Service), the soccer team changed their name to the Spondyville Walkers. The Walkers don't get the publicity the Fusers get, but they are of equal talent and ability. Which, of course means, they have less wins and more tied games then any other team in the soccer playing world. 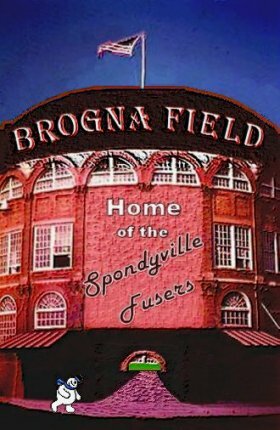 Their home games are being played at Brogna Field only until they raise enough money to build their own stadium. Since Global warming has pretty much eliminated the possibility of Hell ever freezing over, the Walkers will be playing their games at Brogna Field forever. The Walkers are not eligible for the World Cup, but this year are hoping to qualify for the Inflammation Avenue Mid-City Bucket (The I.A.M.C.B.) later this year. Once again, The Walkers will be led by the legendary Tasmanian soccer star and late stage Spondy, "Limpe". Limpe and The Walkers, (whose laid-back strategy of literally slowing down the game to a crawl, earned them the nickname, "Stupid B*st*rds"), employ a number of interesting tactics, such as their patented "Wobbling Wedge", which looks as if the Christmas tree formation has fallen on it's side and can't get up, and the 1-1-1-1-1-1-1 or "Frozen Stick" offense, which looks like ... a frozen stick limping towards the opponent's goal. Unlike most FCs or Football Clubs, the Spondyville Walkers don't "Head" the ball, they perform a manuever called "Spine-ing", in which they turn with their backs to the opposing goalie and bounce the ball off their fused spines. Summing up the Walker's chances in the upcoming season, Tinkerbell Elfmeyer, Sports reporter for the Spondyville Times-Picayune, offered this insight, "The reason the Spondyville Walkers don't do so well, traditionally, is because none of them can bend their necks, and they keep kicking each other in the shins. The season hasn't even started, and there's already 5 players in the hospital with bruised and terribly tattered tibias!" These guys should be muzzled, just like your dog 'Rover'.